To provide the best bicycle security while storing bikes, you’ll want to use bike lockers. In this video, we’ll review the security elements of bike lockers to help you select the best one. With bicycle security as the focus, let’s evaluate the elements of a bike locker that factor into keeping the bike secure during storage. Like commercial bike racks, thieves will most often use hand tools to implement a strategy of cutting and prying to break into commercial bike lockers. 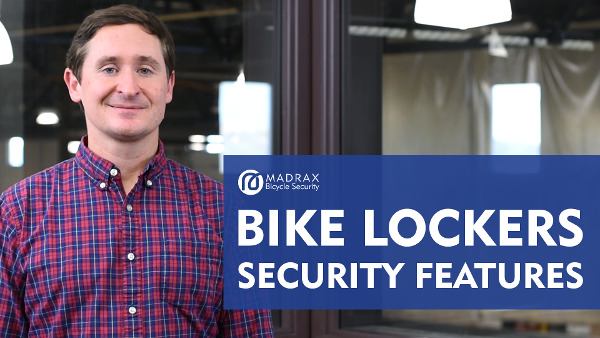 As the main access point into the locker, doors play an integral role as part of the bike locker’s security and are where many prying attacks happen. Make sure the enclosure door frames are constructed with little to no gaps. The smaller the gap the less opportunity a crow bar can be inserted to pry open the door. In addition to the material makeup of doors and panels, perforation is another security item to review. Another major component that contributes to the overall security of bike lockers is the locking mechanism. The most important factor of the locking mechanism will be the number of tabs securing it into the internal frame. Three inserts are recommended. Minimally there should be two. There are also a couple of different locking mechanism styles that are commonly used on bike lockers. The style you select is largely dependent on how you intend to use your bike locker. A locking mechanism with a handle lock is well-suited for public use in first come, first serve scenarios. This mechanism is locked by inserting either a padlock or U-style lock through the handle. Another locking mechanism, T-locks, are best in situations where lockers will be assigned to individuals. Usually as longer-term rentals or leases. It’s also important to ensure the locker can be anchored to the surface. Look for lockers that have pre-drilled holes where spike anchors can be used to attach the lockers to the concrete surface. Bike lockers offer the best security when storing bicycles – when they’re made with the right materials. Use the insights from this video to evaluate the best bike locker for you. What security would you expect from bike lockers? Leave your comments below. Or suggest topics for an upcoming video.